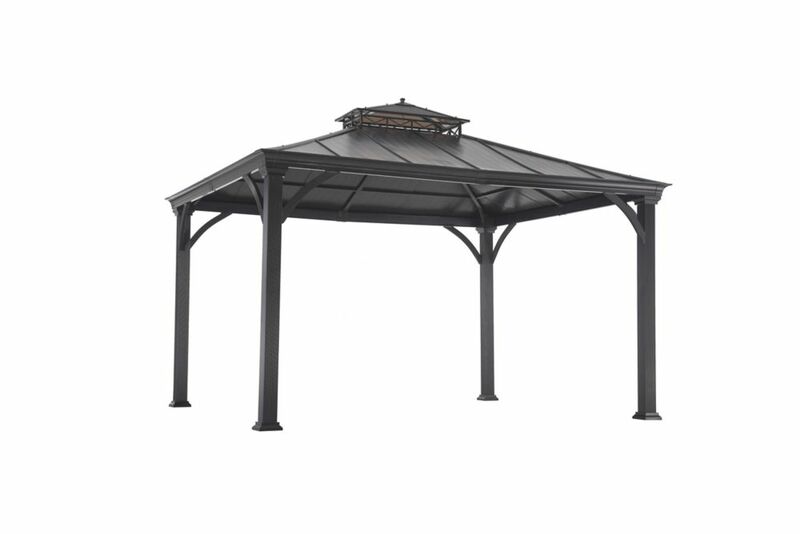 Jackson 12 ft. x 10 ft. Hard Top Gazebo with Two-Tiered Canopy Beautify your yard with the addition of this Jackson Hard Top Gazebo. It offers dual-tiered roof construction, and the upper cupola is made from plastic composite to allow soft light to filter through. Its large frame is big enough to comfortably set up an ideal dining area or lounging zone for the whole family. Jackson 12 ft. x 10 ft. Hard Top Gazebo with Two-Tiered Canopy is rated 4.3 out of 5 by 16. Rated 4 out of 5 by Squid from So far looks like good quality, the instructions could have... So far looks like good quality, the instructions could have been a little better and it was missing a few washers but overall I would recommend it for the price. Rated 4 out of 5 by Anonymous from Happy All the previous comments were both accurate and helpful. I assembled this entirely by myself, taking 16 hours to do so. Set up the roof assembly on stands to work on (you'll need it high enough to walk under so you can work from the inside and outside, but low enough to reach - I had it about 3.5' off the ground). Used rope (attached to an adjacent, permanent awning) and ladders to raise and support it to install the legs. One handy feature was that you can support the roof on the legs before actually attaching them (to give you a break and buy you some time). As with everyone else, some re-drilling of holes was required, particularly when doing the roof sheets. Overall, I'm quite pleased with this product. Rated 5 out of 5 by Jim from Happy With Purchase The pallet was delivered right to our garage. I opened the boxes and the parts were protected by metal frames, all the parts were fine and I carried the pieces to the back yard and took inventory, everything was there. The hardware is in separate packaging (step by step) which made it easy, also the back of the hardware packaging was perforated for easy removal. We followed the instructions and it seemed pretty easy, just a recommendation make sure not to tighten any screws/bolts until all are installed for that particular step. Some parts will need to moved around to get all of the holes lined up and if the screws/bolts are all loose it makes it easier. Me and my son put it together in 8 hours total, it was very hot so half way through we did stop for 1/2 hour to get some water and AC. Very happy with the purchase. Rated 5 out of 5 by SueM from Looks great! I'm very happy with the finished project. It's very sturdy and looks great. Assembly wasn't difficult although there was a section of images missing from the instructions. Having hardware separated into packages according to the step was very helpful. Instructions say you need 6 people to assemble. We did it with 2 for most of the project and had one other person help while we attached the legs. We used cordless screwdriver & ratchets instead of the provided tiny wrench. Assembly was complete in one day. Is there a recommended surface to secure this gazebo to? Can it be secured to the ground, or would it need to be secured to concrete? Hi Ash1, thank you for asking this question you have. The stakes are provided with each gazebo. If the gazebo is placed on soft, level ground, these stakes will be more than adequate to keep your gazebo in place. For solid foundations, such as patio concrete or wood, Sunjoy recommends you secure it with the appropriate anchors. While these types of anchors are not supplied with the product, they can be easily purchased at your local hardware or home store. If you have more questions please feel free to contact our customer service hotline 1-866-578-6569 or visit us at www.sunjoyonline.com. Is it rated for snow load and if so how many pounds per square foot. The unit can withstand heavy snow but I suggest to unload the snow from time to time. If the roof or the canopy is damaged due to any weather reasons may void its warranty. This Gazebo should not be mounted to a deck or patio due to weather conditions. If you wish to secure the gazebo to a concrete and wood surfaces, use anchors suited for these surfaces. Anchors are not included in the package. Does anyone know where I can find the replacement curtains and netting for this model? I'm afraid we don't have the netting and curtains for this model. Is this 4 season tested? Will this last through the winter storms? The gazebo&rsquo;s roof and structure are not guaranteed against extreme weather conditions. Any damage caused by weather is not covered by the warranty. The thickness of roof metal panel is about 2mm and there is no rail to hang a mosquito netting. Is there a link to the exact footprint location of the columns of the gazebo? Also, what are the dimensions of the columns and their color? This gazebo is 10x12ft, it is brown. Is the roof loud during heavy rain? During a heavy rainfall is the roof noticably loud? We have doors out to the deck from our room where this would go and I am worried about whether it would loud enough to cause sleepless nights if it rained hard. Any feedback on how loud/quiet these roof panels are? The gazebo has a metal roof, when rain hits it you will hear it lust like a tin roof on a house, As long as your house is insulated well and your windows and doors are sealed correctly you should not have any issues with the noise problem.